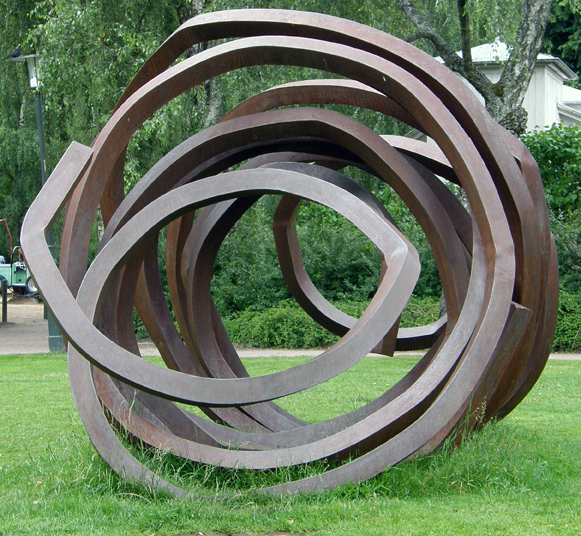 Tangled up in words – a writing diary entry and a brief account of blogging elsewhere – and a visit to Borås and the sculpture I call a tangled eye. I must accept that keeping an account of hours spent doing things other than writing is not going to work. I have been able to keep up my notes on words written this week (to the tune of 751 on average each day, slightly down on last week), but I’ve completely lost track of the time I’ve spent on other things. It’s probably just as well. Although I aspire to time-consciousness, and though I often work well to a deadline, it really goes against my nature. and drop a question on your plate. Last week, apart from my previous At the Quill piece, I wrote two blog entries. One for each of the Blogger and Ipernity sites. On Tuesday I spent the day in Borås, viewing (and re-viewing) the statues in the town, wandering around and taking pictures. The blog entry I called “Pinocchio comes to Borås”. The visit was a bit frustrating and the blog reflects that. I wrote it to raise a laugh and I certainly heard my wife giggling at one or two points after I’d twisted her arm and made her read it. My translator friend in Sundsvall, Lena J, also commented positively. I can imagine though, that I might offend some people who feel positive towards Borås. It was with a degree of trepidation that I published it and sent off a link to most of my contacts on Facebook. (Most former students of mine from Borås). Apart from my private diary and some e-mails, that was the sum total of my writing last week. Not so good, not really. On the other hand, I did manage to write over 5000 words, so I suppose it wasn’t so bad either. Apart from writing, and visiting Borås, the last week involved a deal of photographing and some Photoshopping. (The pictures I published to go with the two blogs and some others I am working on.) I have also been teaching myself the basics of Adobe Illustrator, exploring Creative Commons for music and sound recordings and trying to put together a short slideshow/film of photos and video snips I made when I visited Prora in the autumn with my history teacher colleagues from school. I have an idea for a sound track. It involves mixing the sound of waves on the shore with a track of electronic music (CC) from a German group. To do that I need to be able to understand how to make a mixing board work. I’ve been struggling with something that came bundled with my external soundcard. I managed to get something half right, then discovered it doesn’t seem possible to save the result in any simple music format. (Not MP3, not WAV). I suppose I’m missing something, but it’s frustrating. So, I’ve been creative and I’ve been learning things, but I don’t have a record of the amount of time I’ve spent. It’s not that the hours have been wasted (I hope), but for my own self-confidence it would be nice to be able to look back and say, yes, not only did I write 5000 words last week, but I also spent 20 hours working with my photography and another 10 learning how to use software to make things for my home page. The home page is alive in my head, but it hasn’t come much further than that yet. I should do something about it this week (not least because once it’s up even if only “under construction” then I can post these blogs there).